With noticeable improvements over the AD2 and AD6, Schwinn’s AD7 is by far their most advanced airdyne exercise bike to date. With the AD7, Schwinn is finally giving us a fully adjustable seat- something the more affordable options were lacking. You will also notice significant upgrades in other areas, including the console, frame, and warranty departments. Even if the AD7 is Schwinn’s highest grade air bike, does that mean it’ll work for everyone? More specifically, is this the right bike for you? In order to help you answer that question, I’m going to go into some detail regarding what this bike has to offer. I’m also going to give you my two cents about who I think would benefit the most from a bike like this. By the end of this review, you should have a good idea of whether or not you should consider making the AD7 the newest member of your home gym. What Is An Airdyne Bike? Before we get too ahead of ourselves, we should probably start at the beginning. If you’ve been doing some research on the AD7 for awhile, then this is old news. But if you are just beginning, you may not know what an “airdyne” bike is. Airdyne is simply the term Schwinn coined for their air bikes. Air bikes, also known as fan bikes get their name from the fact that the resistance is created by turning fans as you pedal. The faster and harder you pedal, the more resistance you get from the turning fans. This is one of the reasons air bikes have become so popular, especially with folks that are into HIIT workouts. With an air bike, you have unlimited resistance. You also get a full body workout with the option to use your arms to push and pull the handlebars. Schwinn was the first company to produce an air bike back around 1979. Their airdyne bikes seemed to disappear for awhile, but they have really made a big comeback over the last few years. I think it’s probably in part to the popularity of Crossfit, who use these types of bikes regularly in their workout routines. But just to be clear: air bikes, fan bikes, and airdyne bikes all mean the same thing. Schwinn is the only company that produces “airdyne” bikes. I hope that clears things up. PS- Click here for a cool history lesson on the different Schwinn models over the years, including pics from the original catalogs. Is An Airdyne Bike Right For Me? This is the real question. If you’ve never used one before, you may be wondering what all the talk is about. 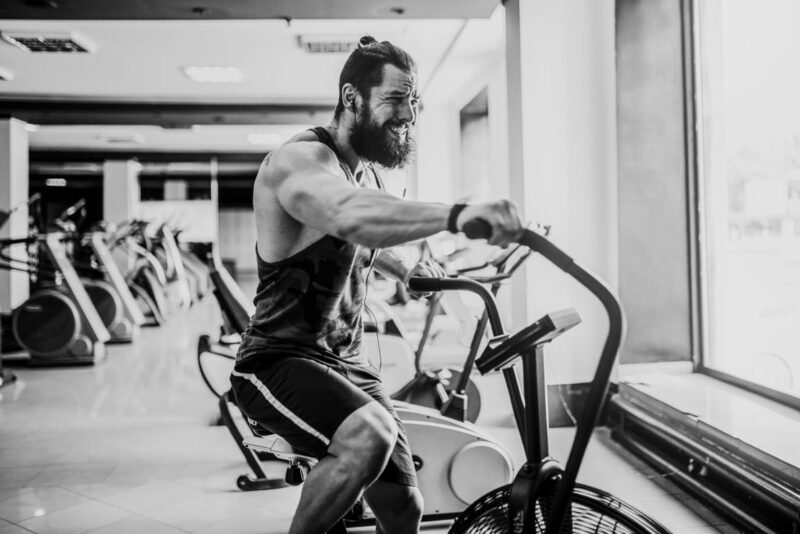 If you have used an airdyne or air bike in the past, you should know whether or not it’s the right bike for you. Air bikes are best used to their fullest potential when doing interval training. This means doing short bouts of really intense exercise, followed by bouts of rest (or working at significantly lower intensity). And then you repeat this cycle for as many intervals as you prefer during your workout. These bikes are perfect for this style of exercise because they are capable of producing so much resistance. Like I mentioned earlier, the resistance is unlimited! As you get stronger and pedal harder, the resistance will also get harder. You directly control how much resistance you feel by simply pedaling faster or slower. And then you count in the fact that you are working your arms at the same time. Not many exercise bikes give you the option of pedaling with your arms too. Bringing your arms into the picture makes it more of a full body workout. Actually, when you are really going at it, you will be engaging your core as well. So, yes, it does provide a full body workout. Which means burning more calories (and fat). So, if you are looking for a bike that can provide a high intensity workout, then an airdyne bike is a smart choice. If you enjoy HIIT workouts or are into Crossfit, then an airdyne bike is a smart choice. If you are looking for a full body workout that you can do comfortably from home, an airdyne bike is a smart choice. If you want an exercise bike that will burn the most calories, an airdyne bike is a smart choice. If you are looking for a more casual, less intense workout, an airdyne bike may not be the best choice. You can certainly ride an air bike at lower intensities, there’s nothing stopping you. But these bikes are really designed to provide high resistance- if you aren’t looking for that, you may be better off with a different kind of exercise bike. Schwinn has been producing airdyne bikes off and on for almost 40 years. All of these years of development and redesign have brought them to the AD7- arguably the most impressive product in their entire lineup. Let’s take a look at the different features included on the bike and see how they stack up. The AD7 is an airdyne bike, so like we discussed earlier all of the resistance is produced by the spinning fans attached to the flywheel. There are no resistance settings like you would see on a traditional upright bike or recumbent bike. The harder you push, the more resistance you get. It’s a great system that works very effectively. The construction of the fan blades themselves are high-grade and designed to work quietly with the single-belt drive system. Fan bikes are always a little noiser than spin bikes because the wind produced makes noise. Personally, I like the noise it makes- when you are really moving the extra noise lets you know you are really working. One fairly significant upgrade the AD7 has over the AD6 and AD2 is the multi-grip handlebars. The handlebars on this airdyne bike give you the option of switching up your grip to change your upper body workout. For example, if I wanted to emphasize my chest and tricep muscles, I would choose an overhand grip and concentrate on the pushing motion. For more of a back and bicep workout, I would choose the neutral or underhand grip and concentrate on the pulling motion. You can even prop your feet up on the stationary foot rests and isolate your upper body completely. It’s a nice feature being able to get an upper body workout from a stationary bike. The seat always seems to be the Achille’s heal on Schwinn’s airdynes. The seats on the AD2 and AD6 are uncomfortable and lack fore and aft adjustments. Finally, on the AD7, we have fore and aft seat adjustability! Hallelujah! Thank you Schwinn. In all seriousness, the seat on this bike is fully adjustable. That means height and horizontal position can be adjusted to make sure you get the right fit. This was always one of the biggest complaints users have about the two other airdyne models. The seat is cushioned, but it’s still not particularly comfortable. That’s just the way it goes with bike seats. I’ve never used a traditional bike seat that I though was comfortable, so I wouldn’t hold that against the AD7. You can always cover the seat with an extra gel cushion or swap out the seat with another bike seat you prefer. The console on the AD7 also got a facelift. The console on the AD6 was a huge improvement over the tiny little screen on the AD2. Schwinn improved it even more with this model. The display screen is even larger that the one on the AD6 and the RPM meter looks more impressive. The built in water bottle holder is also a little more conveniently placed. The cosmetic improvements aren’t the only upgrades here either. Schwinn has included 9 different workout programs with this bike. The AD7 is the only airdyne that has any preprogrammed workouts included. The workouts include intervals, heart rate workouts, and goal driven options (calories, time, distance, etc). Of course the resistance isn’t controlled by the console, it’s controlled by you remember. But the programs will help guide your workouts based on your selection. The AD7 is telemetry heart rate monitor compatible- that’s how the heart rate workouts function. It’s works with any Polar compatible monitors. You have to buy one separately though, one isn’t included (that would be nice though). Putting the AD7 together is pretty straightforward. The owners manual does a nice job of illustrating what goes where and how to do so. The illustrations are large and they zoom in to show you which screw and washer combination to use. The fan and “base” of the bike come preassembled. You are responsible for attaching the stabilizers, the pedals, the console, handlebars, and seat. All necessary tools (a couple Allen wrenches and a little wrench) are included. The manual recommends having 2 people to assemble the AD7, but it can be done by one person. The base is fairly heavy, so the most difficult part would be attaching the stabilizers on the bottom- it would be handy to have a second set of hands to help hold the base while you attach them. Even so, users agree assembly on this bike is pretty easy. Nothing too complicated here. This airdyne bike has the most impressive weight capacity of the bunch at 350 lb. The AD2 has a weight capacity of 250 lb and the AD6 tops out at 300 lb. This makes the AD7 a good choice for larger users. The fully adjustable seat also comes in handy for taller folks. The higher weight capacity is a good sign of the increased durability of the frame. If you ask me, higher weight capacities are always a good thing. This warranty is very similar to the one that comes on the AD6. The only difference is that the AD6 only comes with a 1 year electrical warranty. What About The Airdyne Pro? In your research you may have come across the Schwinn Airdyne Pro. If you take a look at the specs of the Pro, you will notice that they are identical to the AD7. Same bike, same warranty, same weight capacity, same console, same workout programs. Honestly, the only difference I can find is the price. On Amazon the Pro costs $100 more than the AD7. I have read some articles saying that the Pro is the exact same bike but is marketed as a light commercial grade machine. Others have reported that the warranty is better on the Pro. I haven’t found this to be the case. As far as I can tell, the warranties are also identical. If you’re thinking about purchasing the Pro, I would recommend saving yourself a hundred bucks and going with the AD7. The AD7 is currently Schwinn’s highest grade airdyne model. It has the most advanced features, as well as the highest asking price. While this is a very nice exercise bike, in all honesty, it could be more bike than you need, depending on your fitness level and goals. If you are at a moderate to advanced fitness level, the AD7 is a smart choice. It’s the strongest, most durable airdyne Schwinn offers and it has the most comprehensive warranty. Long story short- the AD7 can hold up to the most rigorous workouts you can throw at it. If you are just starting off, you could probably save your self a few hundred bucks and go with the AD6. It too has a very good weight capacity and warranty- it is lacking the preprogrammed workouts though. The AD2 would be more appropriate if you are looking for a budget fan bike. It’s stats can’t compare to those of the AD6 and AD7, but for the price range it’s hard to beat. Overall, if you are looking for the best fan bike on the market, the AD7 is definitely a contender. It’s biggest competition is probably the Assault AirBike, which is also a great piece of machinery. The AD7 has a significantly better warranty though. Is The Assault AirBike Elite The Best Home Exercise Bike In The World?